In this Photoshop tutorial, we're going to look at a great way to help keep things running smoothly as we edit our images by keeping our Photoshop file sizes as small as possible using adjustment layers! In a previous tutorial, we looked at one of the major benefits of adding Photoshop's adjustment layers to our photo editing workflow, which is that they allow us to work flexibly and non-destructively on our images. We can make as many edits and re-edits as we want to a photo and never have to worry about making a single permanent change to the original image. Be sure to check out our Non-Destructive Photo Editing with Adjustment Layers tutorial for more information. Being able to work non-destructively on our images is certainly a great reason to stop using Photoshop's standard image adjustments and start using adjustment layers, but there's other equally good reasons to make the switch. One of the biggest complaints with Photoshop is that no matter how much memory (RAM) you have in your computer, it never seems to be enough. And with the number of megapixels in the latest digital cameras always increasing, the problem just keeps getting worse. Larger photos mean larger file sizes, and the larger the file size, the more of your computer's memory Photoshop needs to work with it. And that's just to get the original photo open your screen. Typically, as you edit the photo, you add more and more layers, and each one of those layers takes up more and more of your computer's memory. On top of that, Photoshop needs even more memory to complete all of the fancy, complex math that goes on behind the scenes as you're working on the image. If your computer runs out of memory as you're working, Photoshop has to use the scratch disk, which is simply an area of your computer's hard drive that Photoshop uses as memory. The problem is, your hard drive is much, much slower than actual system memory, which means that any time Photoshop is forced to use the scratch disk, it will run that much slower. Is there any way that we can reduce the amount of memory that Photoshop needs? There sure is, and that's by keeping our file sizes as small as possible. One way to do that would be to throw out our expensive digital cameras and start taking all of our photos with the little 2 or 3 MP camera inside our cell phones, although the bride and groom may not be too impressed when you show up to take their wedding photos with your iPhone. A better solution would be to come up with a more efficient way of working on our images, one that keeps our file sizes in Photoshop as small as possible without sacrificing any of our editing capabilities. A great way to do that is by using adjustment layers. Let's look at an example. The current size of the Photoshop file is displayed along the bottom of the document window. The flattened and unflattened version of the document are the same size with only one layer in the Layers palette. The Layers palette showing the copy of the Background layer above the original, with its blend mode changed to Screen. The photo now appears brighter after changing the blend mode to Screen. Duplicating the Background layer has caused the Photoshop document to double in file size. Adding a second copy of the image, then lowering the opacity of the new layer to 50%. The photo now appears even brighter after adding a second copy of the image. 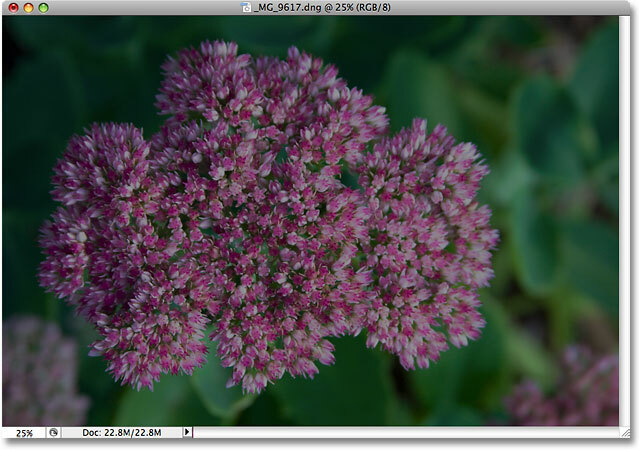 Duplicating the image twice has tripled the file size of the Photoshop document. The three layers have been merged onto a separate layer above them. Increasing color saturation with the Hue/Saturation command. The color saturation in the photo has been increased. The Photoshop document is now four times its original size. Keep in mind that this was just a simple example of how quickly the file size of our Photoshop documents can increase as we edit our images. Your computer may not have a problem working with a document that's only 91.1 MB in size, but with serious photo editing work, or if you're creating complex photo effects, you could easily find yourself working with hundreds of layers, each one taking up more and more of your computer's memory. And as I mentioned earlier, the problem only gets worse as the number of megapixels in today's digital cameras continually increases. How can we keep the file size of our Photoshop documents from getting out of control? 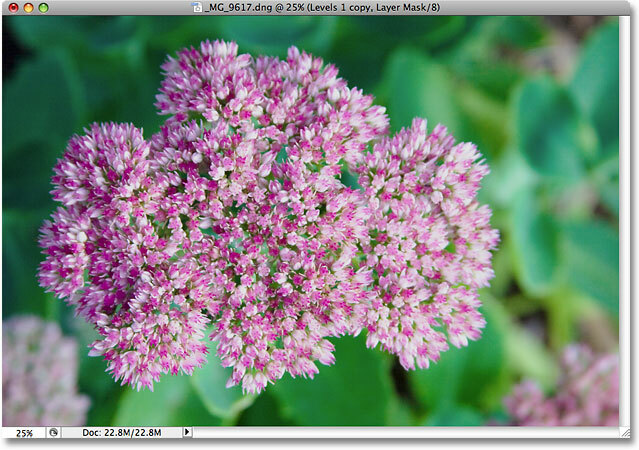 One simple and effective way is by using adjustment layers whenever possible. Let's go through the exact same steps that we just looked at, but this time, rather than creating copy after copy of our image, we'll use adjustment layers! The photo has been reverted back to its original state. Selecting a Levels adjustment layer from the bottom of the Layers palette. The Layers palette showing the newly added Levels adjustment layer above the Background layer, with its blend mode set to Screen. The photo is now brighter after changing the blend mode of the adjustment layer to Screen. The file size remains the same after adding the Levels adjustment layer. We just saved ourselves 22.8 MB of additional file size simply by using an adjustment layer in place of a normal pixel-based layer! Whenever we add an adjustment layer to our document, Photoshop stores all the information about the image within the adjustment layer itself, but it does it without the large file size increases that we get from adding pixel-based layers. In fact, in my case here, the file size increase was so small that it didn't even register. That won't always be the case, but the increase will always be much less than if you had used a pixel-based layer. Why did I choose a Levels adjustment layer as opposed to a Curves or Hue/Saturation adjustment layer? I chose Levels only because it's one of the most commonly used adjustment layers, but since I wasn't planning on doing anything with the adjustment layer (other than changing its blend mode) and only added it in place of a pixel-based layer, I could just as easily have chosen any other type of adjustment layer from the list. Photoshop would have stored all the information about my photo within the adjustment layer no matter which type I chose. Lowering the opacity of the second Levels adjustment layer to 50%. The exposure has been corrected once again, this time with adjustment layers. The file size of the document remains unchanged even after adding two adjustment layers. 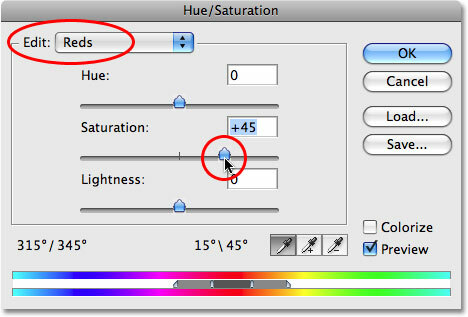 Choosing Hue/Saturation from the list of adjustment layers. Adjustment layers give us exactly the same options as their standard image adjustment equivalents. The final result is exactly the same as before. The file size of the final result remains unchanged thanks to adjustment layers. Again, this was just a quick example of how adjustment layers can keep the file size of our Photoshop documents down to a minimum, yet even in this simple example, I still managed to shave around 68 MB off the size of my file simply by using adjustment layers in place of pixel-based layers! Of course, digital images are made up of pixels and you can't replace every pixel-based layer in your document with an adjustment layer. But the next time you find yourself duplicating a pixel-based layer so you can apply one of Photoshop's standard image adjustments to it like Levels, Curves or Hue/Saturation, try adding an adjustment layer instead. Photoshop and your computer will thank you for it!